Originally manufactured to meet or exceed the high safety standards set for automotive restraint: surplus seatbelt is the best value in webbing available. This 2 inch, 6000 lb. tensile, 100% polyester webbing is UV inhibited and will not shrink, rot, mold, or mildew. Seat belt webbing is an excellent, inexpensive alternative for almost any application. Use this high quality, cost effective material anywhere rope, cable, or other webbings are used. 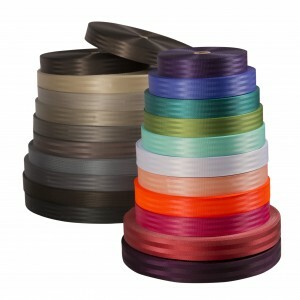 Certified or first-quality webbing at competitive prices along with customized service and low minimum quantities. Custom orders for first-quality seatbelt are welcome. Originally manufactured to meet or exceed the high safety standards set for automotive restraint: surplus seatbelt is the best value in webbing available. Due to the nature of aftermarket seatbelt webbing panel construction and shade will vary. To make sure our customers get what they need we sort according to panel construction and shade. The possible industrial and agricultural applications for seatbelt webbing are countless. We serve customers in many diverse industries including those listed below. Read our blog posts related to seatbelt webbing.